Part 12: Labor Markets and the Macroeconomy. 44. Labor markets and economic growth (R. Topel). 45. Microeconomic perspectives on aggregate labor markets (G. Bertola). 46. Labor market institutions and economic performance (S. Nickell, R. Layard). 47. The causes and consequences of long-term unemployment in Europe (S. Machin, A. Manning). Part 13: Policy Issues in the Labor Market. 48. Race and gender in the labor market (J. Altonji, R. Blank). 49. New developments in the economic analysis of retirement (R.L. Lumsdaine, O.S. Mitchell). 50. Health, health insurance and the labor market (J. Currie, B.C. Madrian). 51. Economic analysis of transfer programs targeted on people with disabilities (J. Bound, R.V. Burkhauser). 52. The economics of crime (R.B. Freeman). 53. Recent developments in public sector markets (R.G. Gregory, J. Borland). A guide to the continually evolving field of labour economics. 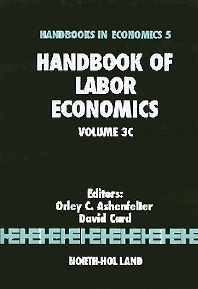 This volume concentrates on the following topics: interactions between the labour market and the macroeconomy; and policy issues within the labour market.